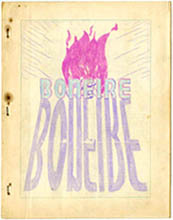 Bonfire - ZineWiki - the history and culture of zines, independent media and the small press. Bonfire was the official organ of the NFFF. The National Fantasy Fan Federation, or N3F as it was commonly referred to, was a fan-run organization which was started in the U.S.A. in 1941, and the same year began publishing its official organ, Bonfire. Louis Russell Chauvenet is credited with naming the fanzine, and was actively involved in the formation of NFFF, serving as its first president. Harry Warner, Jr., in "All Our Yesterdays", relates the history: "The NFFF had begun in the form of a brief article by Damon Knight - 'Unite or Die! ", which was printed in Art Widner's FanFare. It picked up interest fairly fast. By the second issue of Bonfire, the organisation has 29 members..."
According to Harry Warner, Jr., the editors were Harry Warner, Jr., #1; Bob Studly, #2, Art Widner, #3; Harry Jenkins, Jr., #4-6; E.E. Evans, #7. According to the September 2, 2009 issue of the official organ, The National Fantasy Fan, the first editor was E.E. Evans, though this is likely confusing the first issue of Bonfire with the first issue titled The National Fantasy Fan (#4.1), which was edited by Evans. According to the NFFF official website, the first editor was Art Widner. The actual issue lists Art Widner and Harry Warner Jr. as editors. Contributors included Al Ashley (Nova), who was acting president of the NFFF from 1943-1944, while E.E. Evans (Nova) was serving in the military during WWII; Damon Knight (Snide), Harry Jenkins, Jr. (Jinx), Gertrude Kuslan (The Nucleus, Cosmic Tales, FAPA Review), Milt Rothman (Fantasy Fiction Telegram, Imaginative Fiction), Jack Speer (The National Fantasy Fan), Phil Schumann (Frontier), and Bob Tucker (Le Zombie, Science Fiction Newsletter), who was acting president of the NFFF for the year 1945. Copies of the first issue, at least, were distributed through FAPA according to the write up in the September 1941 issue of Futurian War Digest. Seventeen issues were released as Bonfire between its beginnings in June 1941 and the final issue of December 1944, at which point the name of the fanzine was changed to The National Fantasy Fan. This page was last modified on 20 June 2018, at 15:32.